Move the gearshift lever to the required position . 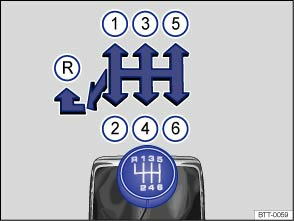 The reverse gear should only be selected when the vehicle is stationary. Shift the gear stick to the neutral position and push down. You should always select the next immediate gear when shifting down gear whilst the vehicle is in motion. The engine revs should not be too high when doing this . Damage to the clutch and the gearbox could occur if at high speeds or high engine revs one or more gears are skipped when shifting down gear, even if the clutch is not released when doing this . Shifting gears incorrectly to a lower gear can lead to a loss of control over the vehicle, with accidents and/or serious injuries as a consequence. Serious damage to the clutch and gearbox could occur if the gear stick of the manual gearbox is shifted to a gear which is too low when travelling at high speeds or at high revs. This also applies if the clutch remains depressed and the gears do not engage.